Darius Jones continues his Man’ish Boy epic with the highly expressive, vital and wildly compelling Le bébé de Brigitte (Lost in Translation). In a year that has seen a revitalization of sorts within the jazz world through a number of high profile releases and critical and commercial successes, Kamasi Washington’s The Epic chiefly among these, jazz seems primed to reestablish itself as the culturally relevant art form it was long held to be. With much of the pop spectrum fracturing into alternately simplistic and complex directions, the intricacies and nuances of the language of jazz should no longer require the public leap of faith it has in recent years. To have a generational icon along the lines of Kendrick Lamar employing a number of jazz players on his albums certainly doesn’t hurt in drawing in a new audience to a vital music. Serving as a more accessible entry point, these types of contemporary pairings could ultimately do for jazz what hip-hop in the ‘80s and ‘90s did for forgotten soul and R&B. But until that day comes (perhaps), we’re left with a host of brilliant young artists currently looking to push the form beyond the stasis created by the predominance of a more classic notion of the music, taking it into new and different directions that seek to stretch the possibilities musically, culturally and socially. Rather than looking back solely at the Bop or Cool traditions exclusively for inspiration, artists are mining the whole of the idiom, coopting elements from each of the major movements and incorporating these within a contemporary framework. And naturally, given the current social and political climate, the vast majority of today’s vital jazz minds are finding inspiration in the freer, more esoteric explorations of their ‘60s forbearers. Primary influences are those who sought to push the envelope in their own time, imbuing the music a vitality based in social and personal struggles that helped move the music beyond mere rote memorization into something far more intimate and, in some instances, extreme. For more than a decade now, Brooklyn-based label AUM Fidelity has positioned itself as a modern-day ESP Disk or Impulse!, two labels that found themselves at the vanguard of the new jazz revolution in the ‘60s. And while the former has since reemerged from a decades long slumber, they tend to favor more noise-oriented and avant garde artists working within a rock framework than the jazz revolutionaries on which they built a name for themselves. 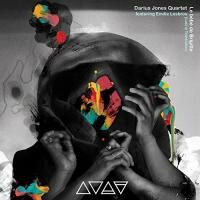 Among the host of contemporary revolutionaries currently releasing consistently compelling music on AUM Fidelity is alto saxophonist Darius Jones. An equally ferocious and vulnerable player, Jones speaks through his instrument, instilling it with a rasp that calls to mind early rock ’n’ roll’s honking players while displaying a melodicism that goes beyond anything these early practitioners could ever imagine. Toeing the line between free and traditional jazz playing, Jones manages to create his own highly identifiable approach to the instrument, drawing from a host of great avant garde players to create a sound that goes well beyond the staid halls of academia into something far more soulful, more personal, more real. On the majestic “Universal Translator", Jones delivers a fiercely fiery solo that culminates in a series of Ayler-esque shrieks that quickly cut off, Jones having pushed his horn and himself to their absolute limits. It’s a thrilling several minutes that are followed by a more rhythmically urgent approach to the piece in the solos of pianist Matt Mitchell, bassist Sean Conly and drummer Ches Smith. Elsewhere, the tracks featuring French vocalist and songwriter Emillie Lesbros call to mind a somewhat less frenetic, though equally boundary-pushing version of Brigitte Fontaine’s work with the Art Ensemble of Chicago (see especially “Quand Vient la Nuit”), the music subtly swirling in complimentary and counterpoint lines that wend in and out of her enchanting vocals. As with Fontaine and AEC’s unlikely pairing, it is Lesbros who pushes the music to extremes, ranging from sultry chanson to wild, Patty Waters-indebted screaming and whispered vocalizations. And fittingly, Jones’ has indicated the Brigitte in the album’s title to be an homage to Fontaine and her highly individual approach to performance and composition. The epic “Beneath the Skin (we are already one)” finds Lesbros descending into Mike Patton-like levels of vocal manipulation that clash unsettlingly with the more elegiac tone of Jones’ composition. It’s a stark contrast that proves highly affecting, leaving the listener with an unsettled feeling that refuses to resolve itself easily as the music seamlessly flows between the traditional and the avant garde, sometimes within a matter of a few bars. All the while, Jones’ soulful playing holds together the somewhat disparate elements of the music. The fifth in a planned series of nine recordings that began with 2009’s stellar Man’ish Boy (A Raw & Beautiful Thing), Le bébé de Brigitte (Lost in Translation) continues the series’ soulful ruminations on contemporary jazz and the human condition. By largely utilizing different players on each release, Jones ensures a unique tonality in each session, ranging from free-blowing to the more subtle and nuanced compositions present here. Stripping the group to its core essentials, “I Can’t Keep From Weeping” presents itself as a modern-day standard, a ballad of intense beauty and sensitivity that gets to the heart of the theme of the music itself. Following Lesbros’ lovely delivery, Jones deploys an aching, keening solo that borrows much tonally from Coltrane, pushing the boundaries of standard balladic soloing. While not quite a revolutionary, declarative statement of intention, Le bébé de Brigitte (Lost in Translation) continues both Jones’ and AUM Fidelity’s winning streak, proving itself to be a vital release that furthers the idea of jazz’s return to cultural relevance and artistic prominence. By borrowing from the past and present, contemporary artists will once again be able to push the music forward into a vibrant and exciting future. With Le bébé de Brigitte (Lost in Translation), Darius Jones places himself at the vanguard.